The Village at Woodside is located minutes from historic downtown Aiken, South Carolina, just outside the gates of Woodside off Silver Bluff Road. Whether you’re coming to work, coming to play or coming home, The Village at Woodside is never far away. From Downtown Aiken, head south on Chesterfield Street for 2.1 miles. Take a slight right on Silver Bluff Road, travel 2.3 miles and The Village at Woodside will be on your left. From I-20 East, (Augusta, GA), take Exit 196 A to 520 East, the Bobby Jones Expressway, and continue 14.7 miles. Take Exit 16 and turn right on Sand Bar Ferry Road/GA 28. When you cross into South Carolina, Sand Bar Ferry Road becomes US-278-East/Williston Road, continue for 6 miles. Turn left onto Silver Bluff Road/SC-302, and continue for 6.5 miles. 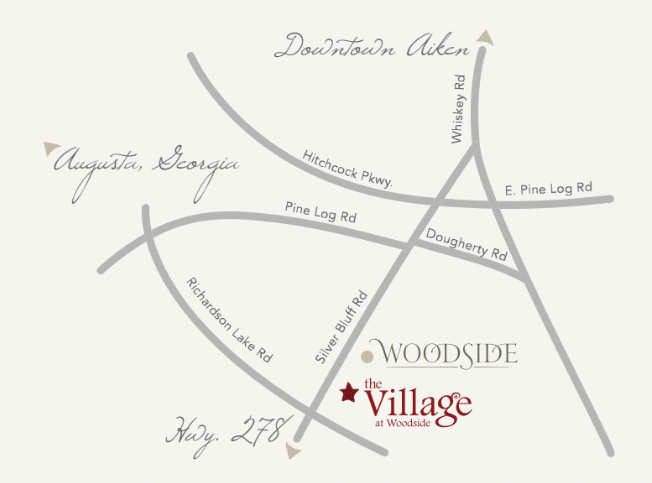 The Village at Woodside will be on your right. From I-20 West (Columbia, SC), take Exit 22, toward Aiken. Turn left on US-1, travel 8.1 miles. Turn right on Richland Ave SE, then left onto Chesterfield Street/SC-19 South, for 2.1 miles. Turn slight right on Silver Bluff Road—The Village at Woodside is 2.3 miles ahead on the left. Are you planning to stop by The Village to explore? Click here for our Plan Your Visit page to schedule an appointment to meet with one of our community experts while you’re in the neighborhood.